Our paper describes the prediction and its comparison to observations. The 3D simulation data is now available. This is our final prediction of the solar corona for the August 21, 2017 total solar eclipse. Our preliminary prediction was posted on July 31, 2017. The above images show two versions of the predicted brightness of polarized white light in the corona. The left image shows an image processed to simulate what would be seen when using a "Newkirk" radially graded filter. The image on the right is the polarized brightness on a log scale, sharpened using an "Unsharp Mask" filter. These are two different attempts to approximate what the human eye might see during the solar eclipse. The image below on the left shows a digital processing of the polarized brightness using a "Wavelet" filter to bring out the details in the image. The image on the right shows traces of selected magnetic field lines from the model. Additional details about the eclipse and our prediction model are given below. These images are aligned so that terrestrial (geocentric) north is up. This is the view of the Sun that would be seen by an observer on Earth with a camera aligned so that vertical is toward the Earth's north pole. In the magnetic field line image, the Sun's surface shows the intensity of the radial component of the photospheric magnetic field. The brightest colors show the location of active regions (strong magnetic fields). Images in a coordinate system aligned with solar north are also available. The last set of images show a special visualization of the three-dimensional (3D) magnetic field. By tracing magnetic field lines at extremely high resolution, we can calculate a 3D map of the so-called magnetic squashing factor - a scientific measure designed to indicate the presence of complex structuring in the magnetic field. We then integrate the map along the line-of-sight, with special weightings to create a composite that resembles solar eclipse images. This is intended to highlight the inherent complexity of the Sun's magnetic field and its intimate connection to visible emission from the solar corona. On August 21, 2017, a total eclipse of the Sun will be visible across the entire contiguous United States. It will trace out a band, approximately 70 miles wide across fourteen states, being first visible shortly after 10:15am PDT at Oregon's Pacific coast, and finally finishing in Charleston, South Carolina. The longest duration of totality will be 2 minutes and 42 seconds, which will occur in Giant City State Park, near Carbondale, Illinois. A partial eclipse will be visible across a much broader band including all of North America, northern South America, Western Europe, and even parts of Africa. To see an interactive map of the path of the eclipse, please visit NASA's interactive Google map, or Xavier Jubier's interactive Google map. For general information about eclipse photography, please visit Fred Espenak's Eclipse website. 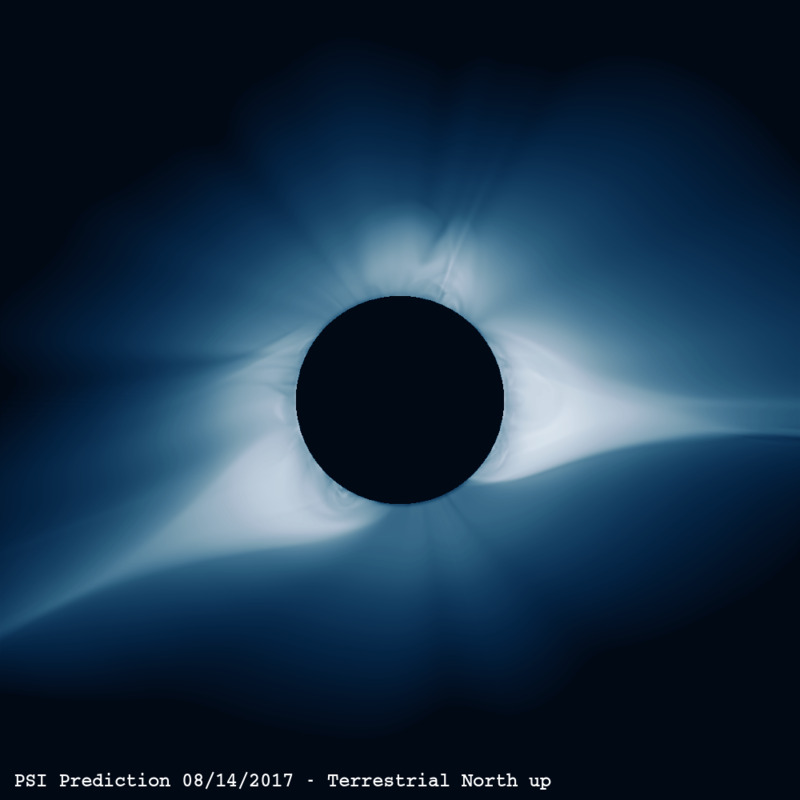 On August 11, 2017, we started an MHD computation of the solar corona, in preparation for our prediction of what the solar corona will look like during this eclipse. 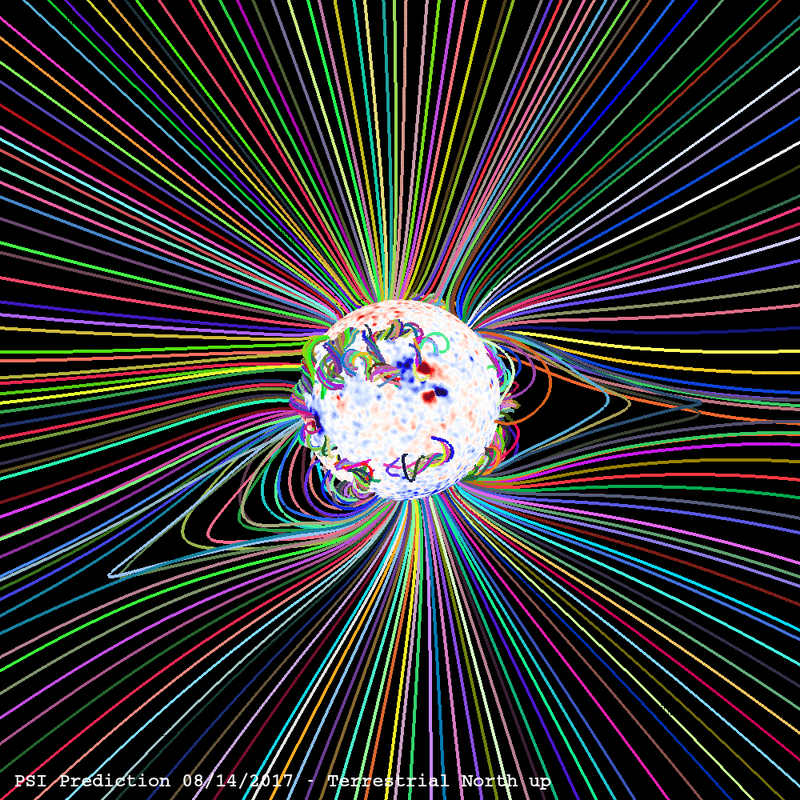 We used data measured by the HMI magnetograph aboard NASA's SDO spacecraft. We used a combination of HMI synoptic maps, including data for Carrington rotation 2192 combined with data from a part of Carrington rotation 2193 measured up to 12:00 UTC on August 11, 2017. You can read the details about the evolution of the photospheric magnetic field that was used to make our prediction. 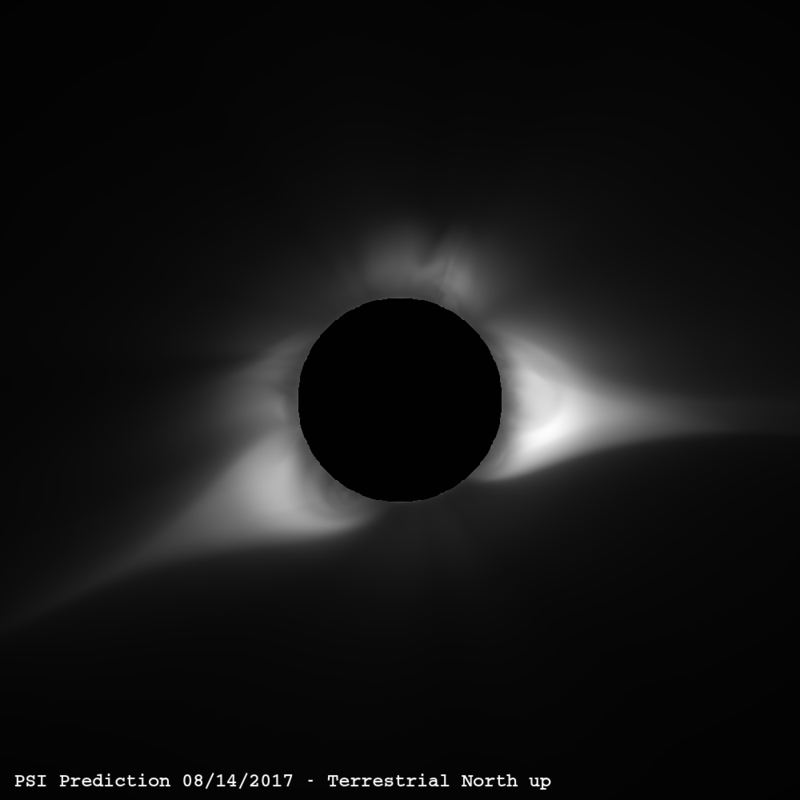 This final prediction of the state of the solar corona during the eclipse was posted on August 16, 2017. This updates the preliminary prediction posted on July 31, 2017 with newer magnetic field data. 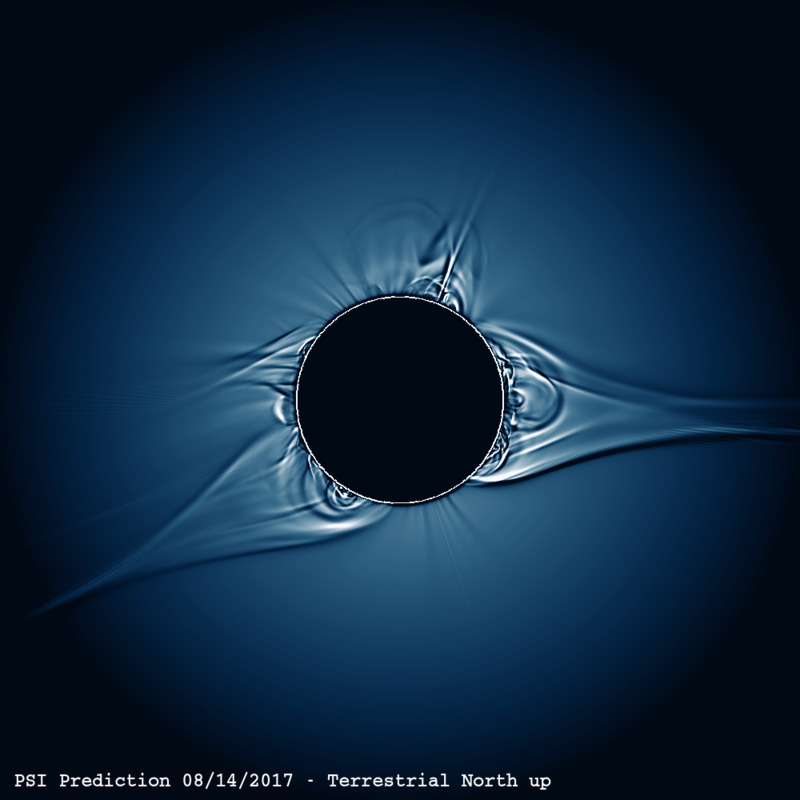 Our prediction is based on a magnetohydrodynamic model of the solar corona with improved energy transport. While our earlier predictions incorporated a more simplistic heating formalism, for the first time, here, we have applied a wave-turbulence-driven (WTD) methodology to heat the corona. 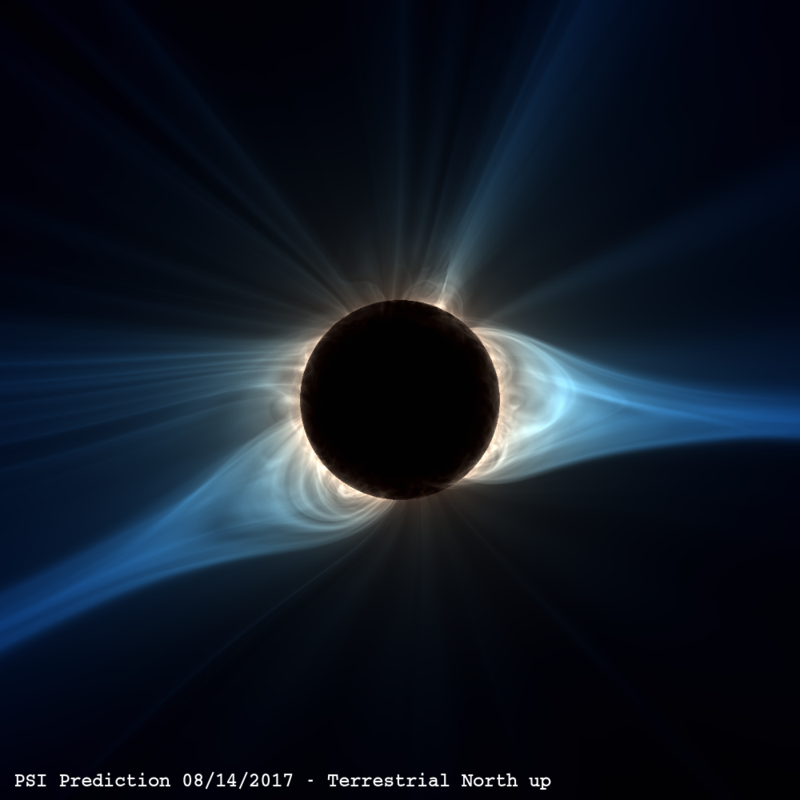 This model better reproduces the underlying physical processes in the corona, and has the potential to produce a more accurate eclipse prediction. Additionally, these simulations are among the largest we have performed, using 65 million grid points. For technical details about our model, please see the publications. For our final prediction, we introduced magnetic shear along polarity inversion lines (PILs - lines separating positive and negative polarity regions) where filament channels were observed in EUV emission by SDO/AIA. This is a well-known feature of large-scale coronal magnetic fields that we have not accounted for in past predictions. The handedness of the shear is deduced from the combination of a magnetofrictional model and a surface flux transport model; special thanks go to Duncan Mackay (University of St. Andrews), Anthony Yeates (Durham University), and Lisa Upton (High Altitude Observatory) for their help - see Energized Fields. The introduction of shear qualitatively changes the shape of the streamers and the connectivity of the underlying fields, and increases the free magnetic energy in the corona. It can even produce a CME. From our model, we can predict quantities that can be observed directly. We provide images of the total brightness (B) and the polarized brightness (pB). The B resembles what is seen by the naked eye. However, pB is the more scientifically useful quantity. Traditionally, pB has been used to separate light scattered by the K-corona and the F-corona. The K-corona is the photospheric light scattered by electrons in the corona, while the F-corona is the photospheric light scattered by dust, which is unpolarized. Note that we do not model the F-corona so its contribution to B is not included. We can also estimate emission in extreme ultraviolet (EUV) wavelengths and X-rays. The EUV emission can be compared with solar observations from the EIT imager on SOHO, and the AIA instrument on SDO. X-ray emission can be compared with solar observations from the XRT instrument on Hinode. You can read the technical details about the calculations that were used to make our predictions. Z. Mikić, J. A. Linker, D. D. Schnack, R. Lionello, and A. Tarditi, Magnetohydrodynamic Modeling of the Global Solar Corona, Physics of Plasmas, 6, 2217 (1999). Z. Mikić, J. A. Linker, P. Riley, and R. Lionello, Predicting the Structure of the Solar Corona During the 11 August 1999 Total Solar Eclipse, in The Last Total Solar Eclipse of the Millennium, Proceedings of the Conference held in Istanbul, Turkey, 13-15 August, 1999 (W. Livingston and A. Ozguc, eds. ), ASP Conference Series, Vol. 205, p. 162 (2000). Z. Mikić, J. A. Linker, R. Lionello, P. Riley, and V. Titov, Predicting the Structure of the Solar Corona for the Total Solar Eclipse of August 1, 2006, in Solar and Stellar Physics Through Eclipses (O. Demircan, S. O. Selam, and B. Albayrak, eds. ), ASP Conference Series, Vol. 370, p. 299 (2007). R. Lionello, J. A. Linker, and Z. Mikić, Multispectral Emission of the Sun During the First Whole Sun Month: Magnetohydrodynamic Simulations, Astrophys. J., 690, 902 (2009). V. Rušin, M. Druckmüller, P. Aniol, M. Minarovjech, M. Saniga, Z. Mikić, J. A. Linker, R. Lionello, P. Riley, and V. S. Titov, Comparing Eclipse Observations of the 2008 August 1 Solar Corona with an MHD Model Prediction, Astron. Astrophys., 513, A45 (2010). P. Riley, J. A. Linker, R. Lionello, and Z. Mikić, Corotating interaction regions during the recent solar minimum: The power and limitations of global MHD modeling, Journal of Atmospheric and Solar-Terrestrial Physics, 83, 1-10 (2012). R. Lionello, M. Velli, M., C. Downs, J. A. Linker, Z. Mikić, and A. Verdini, Validating a Time-Dependent Turbulence-Driven Model of the Solar Wind, Astrophys. J., 784, 120 (2014). C. Downs, R. Lionello, Z. Mikić, J. A. Linker, and M. Velli, Closed-Field Coronal Heating Driven by Wave Turbulence, Astrophys. J., 832, 180 (2016). Our work is supported by NASA (Heliophysics Supporting Research and Living with a Star programs), AFOSR, and NSF. We are grateful to NASA's Advanced Supercomputing Division (NAS) for an allocation on the Pleiades supercomputer, and the Extreme Science and Engineering Discovery Environment (XSEDE) for allocations on Stampede2 at the Texas Advanced Computing Center (TACC) and Comet at the San Diego Supercomputer Center (SDSC), which allowed us to complete the eclipse prediction simulations shown here. We also thank the SDO/HMI team of the Solar Physics Group at Stanford University for their support in providing timely access to HMI Synoptic magnetograph data.